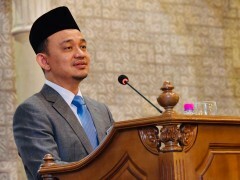 SIMPANG RENGGAM: Education Minister Dr Maszlee Malik has confirmed he has resigned as International Islamic University Malaysia (IIUM) president. However, Maszlee, who is also the member of parliament for Simpang Renggam, did not give the exact date of his resignation and when he sent in his resignation letter. "Yes, I'd resigned when I submitted the (resignation) letter," he said after handing over chairs for the Simpang Renggam Health Clinic, here, today. Also present were Family Health and Medicine specialist and head of Simpang Renggam Clinic Dr Fatimah Hassan. Last September, Dr Maszlee was appointed as the seventh IIUM president for a period of three years after receiving consent from IIUM Constitutional Head, Sultan Ahmad Shah of Pahang. He replaced Tan Sri Dr Rais Yatim whose contract ended in July last year. However, controversy arose soon after, when many protested against his appointment as he also holds a Cabinet post. Earlier in November, Maszlee Malik agreed to resign as IIUM president. Asked to comment on talks that former IIUM vice chancellor Datuk Dr Mohd Daud Bakar would be appointed as the new president to replace him, Maszlee said it was the prerogative of the university to do so.